NORMAL POSITION - the centerline of the face view of the insert pattern is aligned with the shell key on the plug and keyway on the receptacle. Angle A on the above drawing would be at zero degrees. ALTERNATE POSITION - the centerline of the face view of the insert pattern is rotated in relationship to the shell key on the plug and keyway on the receptacle. Pin key inserts are rotated clockwise (CW). For example, a 14S-7 pin insert layout in the X position would have an angle A of 180 degrees. 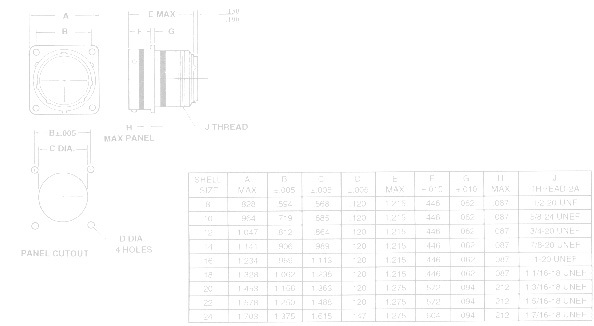 NOTE: This tabulation includes the MIL-C-83723 Series II connectors that are no longer recommended for retro-fit or new design. The difference between the MIL-C-5015 Series III and the MIL-C-83723 Series II is the MIL-C-5015 Series III has a captivated coupling ring on the plug. MIL-C-83723 Series II has a separate coupling ring retained when the backshell is attached. Otherwise, they are identical and intermateable.